Happy Saturday to all. My dad has '57 and a previous owner boogered up the drivers side knuckle. Bad enough it broke last fall as he was pulling into the driveway. Tire fell off....at any rate we are looking for either a complete axle or the outer knuckle. I had the same problem last year & was referred to a guy , John , he found one for me & I am sure he can find one for you too. His number is 651-653-0147 , Can you provide any info on the wheels & tires pictured on your truck , I have been looking to find or have made new wheels for mine. What size are they & where did you get them ? 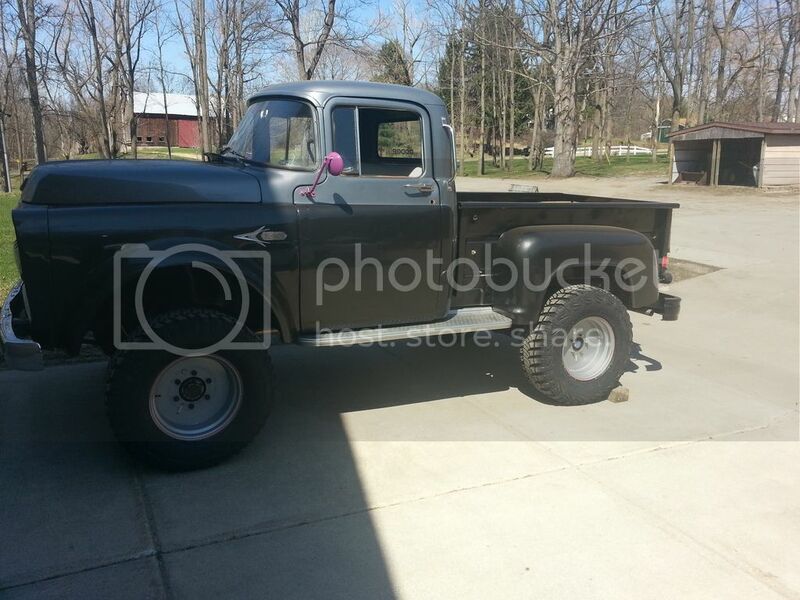 Nice truck, I love the 57's. I agree that Jon would be a good source to try for an axle. He lives about half an hour from me in East central Minnesota. PM me we might work out something. Gotta fiddle with the picture so it'll fit or I'll e-mail it. don't believe i can due to post count or lack of. The axles under my Sig '57 TW-PW are being replaced by axles I can more easily get parts for. It will be a couple of months to get it finished. I work alone. Front axle is complete with 4.89(?) road gears, Locking Hubs and new brake parts. Rear Axle is Mopar 8.75" open with a left drum that will not come off. Yes, I tried that also... it's stuck. If you are interested in the axles and want to wait, they will be available eventually. ah. icic. well i know he does not need a rear, has a currie dana 60 from the previous owner. willing to sell just the front axle? Ron in Indiana might have something also. sorry for slacking on a response. my dad called john and hopefully getting what he needs. thank you everyone! He has slowly been picking away at getting the truck back together. We got the brake bled yesterday and he took it out for a spin. All seems well.